By the time 5:30pm rolled around Tuesday night, the 40 people chatting in Syracuse University London’s auditorium were doing so comfortably. Thanks to Cashew Catering, they were getting cosy with lentil chilli, slicking hummus and tapenade and yoghurt on artisan bread, savouring slow-roasted veggie salad and gently devouring every delectable, chewy brownie in sight. These SU London students, faculty, staff and friends were gathered for ClimateKeys: A Musical Conversation about Environmental Justice. 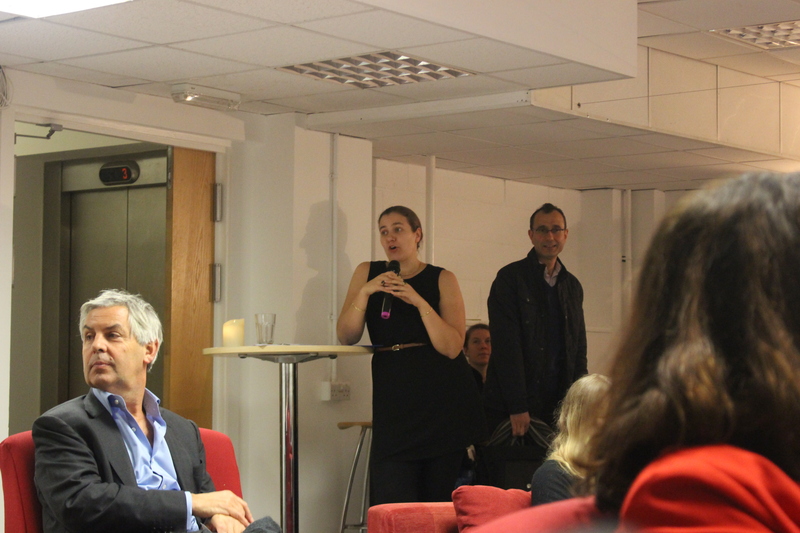 Similar to SU London’s free speech symposium, the evening was filled with discussion. But as the name would suggest, the event was dissimilar in that art reigned supreme as our medium of expression. The night was kicked off by Jason, who introduced us to ClimateKeys and performed a piece about the power of music. Next, we heard from Lola Perrin, who is also the founder of ClimateKeys. As a pianist and environmental advocate, Perrin is working at the intersection of creative expression and activism. Shows in the 2017 ClimateKeys concert series have taken place elsewhere in the U.K., as well as in Canada, the U.S., Germany, Serbia, France, New Zealand, Turkey, Wales, Bosnia + Herzegovina, and Wales. We then heard from concert guitarist Michael Poll and Rebecca Farnum, who is an expert in environmental and social justice as well as the Middle East. We then were given binders to help lead our discussion. The couches we were sitting on were clustered by subject. The topics were war and conflict, technology and ethics, conservative voices (as in political diversity, not conservation), the media, non-human animals, food and agricultural systems, race and space, and global citizenship. There were also relevant news stories in each binder that highlighted the timeliness of each topic. After our discussion as groups, Terrin, Rebecca, Maggie, Iain and Francesco performed an experimental piece about the death of coral reefs. The experience was achieved through a trombone, a trumpet, a bass guitar, a violin and ocean sounds. Afterward, each group got to speak their piece and answer their question. It was refreshing and yet, unsurprising, how passionate and well-informed my peers are when it comes to climate change issues. Being a social justice-inclined bunch as it is, I shouldn’t expect anything less. When it came time for the media group to speak, Andre performed a piece about the malleability of the “truth” when it comes to climate change. Likewise, when we arrived at the global citizenship group, I got to perform my own piece. It is about navigating life as a consumer in a developed, “first world” nation with enough money to have a disposable income, but not enough to afford ethically made clothes. As someone who loves fashion, only has so much money at this time and wants to ensure that marginalized peoples aren’t further marginalized, I have a lot of guilt about my shopping habits. Next to being elated to have an outlet where I could express this sentiment, I was so grateful I got invited to perform tonight. As a whole, I am glad events like those apart of Perrin’s ClimateKeys exists. Words are great, obviously, but there is something so magical about music and words repurposed into lyrics (as spoken word is more akin to). On a personal note, it’s been a minute since I wrote poetry. Rediscovering that side of myself lately was nice. It was also my first time performing original work in front of an audience. It felt so good to share, which is strange. After suffering from intense anxiety for most of my life, the thing I was most afraid of now feels good. Helping spark discussion and lay the foundation for civic engagement among my peers tonight made me feel like I was making a tangible difference in the world. Know that if ever there arises another opportunity for me to give back and provoke people intellectually like ClimateKeys provided, best believe I’ll sign up.